As technology continues to progress and evolve, becoming ever closer to achieving the essence of humanity while having long ago surpassed the mental capabilities of any human, the innate fear of it continues to grow as well. So much money and personal data is willingly given to any interested party in the name of keeping up with the latest technology or fad, and yet people continue to become more and more afraid of what that technology will be able to achieve in the long run, perhaps putting lives at risk in the process. 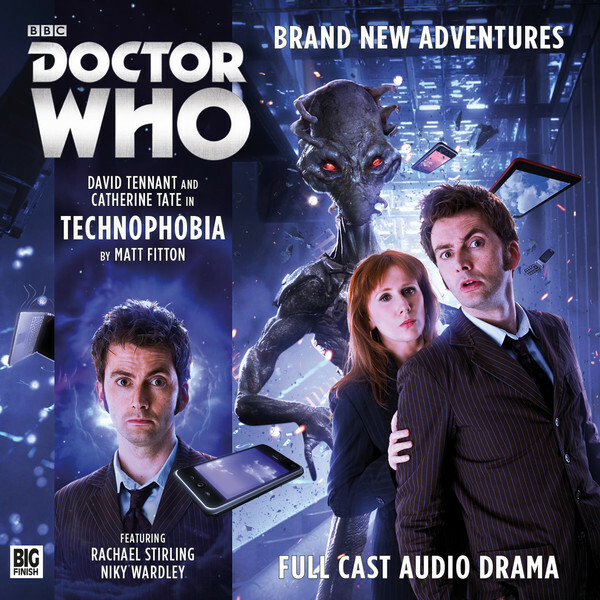 This is absolutely not a unique basis for a science fiction story, nor even for a Doctor Who story, but ‘Technophobia’ manages to put an extremely interesting twist on the concept while acting as a series opener of sorts by reintroducing fans to the duo of David Tennant’s Tenth Doctor and Catherine Tate’s Donna Noble. It comes as no surprise that there has been a lot of anticipation for this release as the first of three in the new Tenth Doctor Adventures box set, this being the first true modern Doctor Who pairing that Big Finish has had the chance to explore with both the Doctor and companion reprising their roles. David Tennant is still regarded as one of the favourite men to have played the titular role so far, and he certainly deserves due credit for helping to make the programme the international success that it is, and writer Matt Fitton is deftly able to capture Tennant’s infectious energy, manic enthusiasm, and determined authority. Whether the choice was made on purpose or purely by a quirk of scheduling, the idea to pair him back with Donna is a masterstroke. Tennant’s third series with Donna by his side was easily his most powerful and comfortable, and having these two best friends continue their travels instead of having to dedicate time to at least mentioning the more romantic notions that Rose and Martha would bring into a story is refreshingly straightforward. Tate, it should be stated, also reprises her role as the feisty and strong Donna mesmerizingly well, and the camaraderie between the two leads is instantly apparent. As the Doctor and Donna land back in London and visit the Museum of Technology, the general populace is quickly growing afraid of all technology, some even believing that it is turning on them with intent to harm. After some clever sleight of hand where the listeners are led to believe that this is another case of technology gone bad or else some means of an alien incursion, the real truth is much more ominous and disturbing. Thus is the Koggnossenti race introduced, a completely new alien foe for the franchise and one bent on conquering the Earth by removing the higher brain functions of humans. Unfortunately, though, the aliens themselves are actually the weakest part of the story, the mystery surrounding and the buildup to their reveal being much more exciting than the being themselves. Judging by the cover art, the Koggnossenti are quite an impressive-looking foe, but the lack of menace in their voices and conversations doesn’t quite match the scope of their schemes and all of their work is undone exceedingly quickly and easily. It also would have been nice to meet some of the more devolved humans that are mentioned so frequently, but this doesn’t detract from the story in any meaningful sense. Filled with brilliant dialogue, vivacious performances, and a blistering pace, ‘Technophobia’ includes everything that made series four of modern Doctor Who such a success. Even if its core concept of fear of technological advancements is nothing new and the alien threat is extricated rather easily and uneventfully, the journey from beginning to end is a joyous one and a welcome return of arguably the strongest Doctor-companion pairing in recent years as if no time has passed at all.